Citation: Roy A. Synthesis of silver nanoparticles from medicinal plants and its biological application: A review. Res Rev Biosci. 2017;12(4):138. Nano-biotechnology holds a great potential in various fields of life sciences. Nanotechnology involves the use of materials with components that have dimensions less than 100 nm. The demand for green synthesis of nanoparticles increases day by day due to the drawbacks of chemical synthesis. Application of nano-sized materials is an emerging area of nanotechnology. Among various metal nanoparticles, silver nanoparticles gain special interest due to its remarkable properties. Silver nanoparticles are usually ranging from 1-100nm size. They have unique electrical, optical, and thermal properties and which can be incorporated into industrial application of electronics, catalysis, and photonics. Silver nanoparticles exhibit a broad spectrum of anti-bactericidal and anti-fungicidal activities making them extremely popular in a diverse range of consumer products, including plastics, soaps, pastes, food, and textiles, thus increasing their market value. The presence of soluble organics in the plant extracts was mainly responsible for the silver ions reduction to nano-sized silver particles. The present review provides information on silver nanoparticles synthesis from various medicinal plants, various methods of characterization and it's biological application. Nano-technology is a rapidly growing field in which research deals with the synthesis, design, and particle structures manipulation which are ranging from 1-100 nm. Nanoparticles show various applications such as environmental, food, health care, optics, healthcare, chemical industries, etc. Nanobiotechnology is a part of nanotechnology and multidisciplinary in nature which investigates the use of nanoparticles in the biological systems. Nanobiotechnology provides a crucial technique for the development of a clean, nontoxic, and environment-friendly process for metal nanoparticles synthesis which has the ability to reduce metals by specific metabolic pathways. Nanoparticles show specific characteristics as compared to large particles such as their morphology, size, and distribution. Chemical and physical methods for synthesis of nanoparticles are costly and releases toxic byproducts in nature. Due to these problems, there is a requirement of an alternative for synthesis of nanoparticles. It has also seen that silver nanoparticles synthesized from chemical methods show less antibacterial activity as compared to the nanoparticles synthesized from biological approach. This is may be due to the presence of protein coating of nanoparticles obtained from plant extract [1-5]. Various nanoparticles have been synthesized by using plant extracts which includes silver, gold, and copper oxide. Use of plant extracts for nanoparticles synthesis is favorable over the other biological material as it removes the long process of maintenance of cell culture. Among various metal nanoparticles, silver nanoparticles obtain more attention due to its good conductivity, stability and antimicrobial activity. The biological activity of silver nanoparticles depends on various factors such as size, shape, size, surface chemistry, distribution, particle composition, particle morphology, capping, agglomeration, etc. . Nanoparticles physicochemical properties increase the bioavailability of therapeutic agents [6-26]. Therefore, development of silver nanoparticles with controlled structures that are uniform in morphology, size, and functionality is important for its various applications [27-40]. Utilization of various plants extracts for silver nanoparticles synthesis has to gain importance due to its various advantages such as eco-friendly, rapid, non-pathogenic and economical. Reduction and stabilization of silver ions are due to the combination of biomolecules such as amino acids, proteins, enzymes, alkaloids, saponins, terpenoids, phenolics, tannin and vitamins present in plant extracts. Plant extracts reduce the AgNO3 which forms Ag3+ ions to AgO ions; this can be monitored by using a UV-Visible spectrophotometer. Large numbers of plants are reported to have the potential of synthesizing the silver nanoparticles are mentioned in Figure 1 and Table 1. 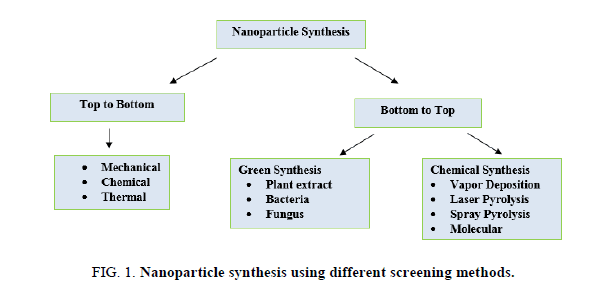 Figure 1: Nanoparticle synthesis using different screening methods. Table 1. Synthesis of silver nanoparticles from different medicinal plants. Physico-chemical properties are significant for behavior, safety, bio-distribution, and efficacy of nanoparticles. Therefore silver nanoparticles characterization is necessary to evaluate the functional aspects of synthesized silver nanoparticles. Characterization of synthesized silver nanoparticles can be done by using various methods (Figure 2) [41-60]. 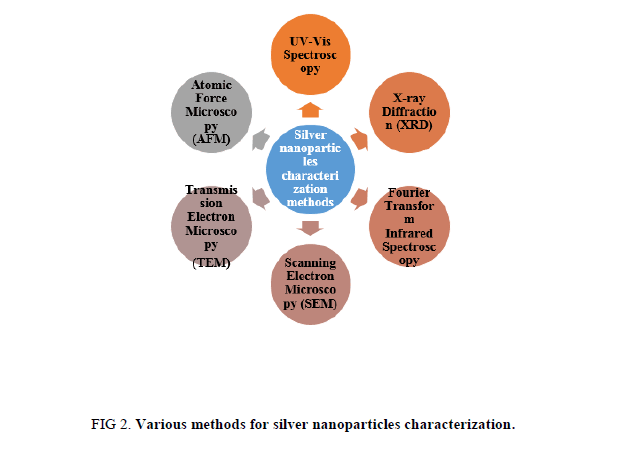 Figure 2: Various methods for silver nanoparticles characterization. UV-VIS spectroscopy is an exceptionally valuable and essential for characterization of nanoparticles. AgNPs have unique optical properties which make them firmly cooperate with particular wavelengths of light (UV/VIS/IR Spectroscopy Analysis of Nanoparticles in 2012) [50-61]. UV-VIS spectroscopy is quick, simple, basic, and specific for various sorts of NPs, needs just a brief period of time for estimation [62-64]. In AgNPs, the conduction band and valence band lie near each other in which electrons move openly. These free electrons offer ascent to a surface plasmon reverberation (SPR) assimilation band, this is occurring because of the aggregate swaying of electrons of silver nanoparticles in reverberation with the light wave . The assimilation of AgNPs relies upon the molecule estimate, dielectric medium, and synthetic surroundings . Observation of this peak assigned to a surface plasmon is very much recorded for different metal nanoparticles with sizes running from 2 nm to 100 nm . FTIR can give exactness, reproducibility, and furthermore an ideal signal to noise ratio. By utilizing FTIR spectroscopy, it become possible to identify little absorbance changes on the order of 10−3, which performs distinction spectroscopy, where one could recognize the little assimilation groups of practically dynamic deposits from the extensive foundation ingestion of the whole protein . FTIR spectroscopy is often used to see if biomolecules are associated with amalgamation of nanoparticles, which is more articulated in scholarly and modern research . Besides, FTIR has additionally been stretched out to the investigation of nano-scaled materials, for example, affirmation of useful atoms covalently united onto silver, carbon nanotubes, graphene and gold nanoparticles, or co-operations happening amongst catalyst and substrate amid the reactant procedure . FTIR is an appropriate, important, non-invasive, cost effective, and basic strategy to recognize the role of biological molecules in the reduction of silver nitrate. X-ray diffraction (XRD) is a popular analytical technique which has been utilized for the examination of both atomic and crystal structures, qualitative identification of various compounds, measuring the degree of crystallinity, quantitative resolution of chemical species, particle sizes, isomorphous substitutions, etc. . At the point when X-ray light reflects on any crystal, it prompts the development of numerous diffraction designs, and a pattern reflects physico-chemical attributes of crystal structures. In a powder sample, diffracted patterns commonly originate from the specimen and reflect its structural physico-compound features. In this way, XRD can examine the basic features of an extensive variety of materials, for example, inorganic impetuses, superconductors, biomolecules, glasses, polymers, etc. [43-45]. Field of nanotechnology has given a main thrust in the improvement of different high-determination microscopy procedures with a specific end goal to take in more about nanomaterials utilizing a light emission vigorous electrons to probe object on a fine scale . Among different electron microscopy, SEM is a surface imaging technique, completely equipped for resolving various molecule sizes, size distributions, nanomaterials shapes, and the surface morphology of the particles at the small scale and nanoscales . Utilizing SEM, we can test the morphology of particles and get a histogram from the image by either by measuring and checking the particles physically, or by utilizing particular programming . TEM is a significant, frequently utilized, and critical system for the characterization of nanomaterials. It is used to get quantitative measures of molecule and additionally grain size, size distribution, and morphology . Magnification of TEM is mainly controlled by the ratio of distance between the objective lens and the sample and the distance between objective lens and its image plane . AFM is used to investigate the aggregation and dispersion of nanomaterials, in addition to their size, shape, sorption, and structure; three different scanning modes are available, including contact mode, non-contact mode, and intermittent sample contact mode . It can also be utilized to characterize the nanomaterials interaction with supported lipid bilayers in real time, which is not achievable with current electron microscopy techniques . AFM does not require oxide-free, electrically conductive surfaces for measurement, does not because appreciable damage too many types of native surfaces and it can measure up to the sub-nanometer scales in aqueous fluids [61-64]. Silver nanoparticles have been extensively used in health care, food, environment and biomedical sectors. Application of silver nanoparticles includes anti-bacterial, anti-viral, anti-fungal and anti-cancer activities. Silver nanoparticles are the alternative anti-bacterial agents which show the ability to overcome the resistance of bacteria against the antibiotics. A study reported the anti-microbial activity of silver nanoparticles against the E.coli, in which E.coli cells were treated with silver nanoparticles and these nanoparticles gets accumulated in cell wall and forms the pits in the cell walls which lead to the death of the cells . Another study reported the role of silver nanoparticles against E.coli, yeast and Staphylococcus aureus. In this study, it was suggested that at a lower silver nanoparticles concentration inhibits the complete growth of E.coli and yeast whereas mild effect was observed in S. aureus . Silver nanoparticles synthesized from biological method shows significant role against methicillin-resistant Staphylococcus aureus, methicillin-resistant Staphylococcus epidermidis and Streptococcus pyogenes, whereas in case of Salmonella typhi and Klebsiella pneumoniae it shows moderate . Khurana et al. investigated the physical and surface properties of silver nanoparticles against S. aureus, B. megaterium, P. vulgaris and S. sonnei. Fungal infections are more common in patients who are immune-suppressed and overcoming this problem is not an easy process due to the less number of anti-fungal drugs . Therefore there is a requirement to develop antifungal agents which is non-toxic, biocompatible and eco-friendly in nature. Silver nanoparticles play an important role in various fungi. Silver nanoparticles showed potential against clinical isolates and ATCC strains of Candida species and Trichophyton mentagrophytes. Silver nanoparticles synthesized from biological method showed increased antifungal activity with fluconazole against Phoma herbarum, Phoma glomerata, Fusarium semitectum, Candida albicans and Trichoderma sp. . Another study also reported the role of silver nanoparticles against several phyto-pathogenic fungi which include Alternaria alternata, Macrophomina phaseolina, Sclerotinia sclerotiorum, Botrytis cinerea, Rhizoctonia solani, and Curvularia lunata [22,31] Silver nanoparticles not only inhibits human and plant pathogenic fungi, but also able to inhibit other fungal species such as Aspergillus fumigates, Penicillium brevicompactum, Chaetomium globosum, Cladosporium cladosporoides, Stachybotrys chartarum, and Mortierella alpine . Viral diseases are frequent and becoming more prominent all over the world, therefore, there is a requirement of developing new antiviral agents. Silver nanoparticles show unique interactions with bacteria and viruses due to its certain size and shapes. [5,28]. Anti-viral activity of silver nanoparticles incorporated into the polysulfone ultrafiltration membranes was evaluated against the MS2 bacteriophage and it showed the significant antiviral activity . Lara et al. demonstrated the anti-HIV activity at an early stage of viral replication. Polyvinyl pyrrolidone coated silver nanoparticles blocks the transmission of cell-associated HIV-1 and cell-free HIV-1 isolates . Another study also reported the role of silver nanoparticles against HIV and hepatitis B virus . Cancer is one of the prominent diseases which infect both developing as well as the developed country. Therefore, there is a requirement to develop new techniques which are able to reduce the systemic side effects. Gopinath et al. investigated the molecular mechanism of silver nanoparticles and found that programmed cell death was concentration-dependent. Further, the synergistic effect on apoptosis using uracil phosphoribosyltransferase expressing cells and non- uracil phosphoribosyltransferase expressing cells in the presence of fluorouracil was observed. In these conditions, it was observed that silver nanoparticles not only induce apoptosis but also sensitize cancer cells. Jun et al. also reported that silver-embedded magnetic nanoparticles showed significant activity against breast-cancer cells and floating leukemia cells. Plant extract synthesized silver nanoparticles showed a toxic effect on the human lung carcinoma cells (A549) which indicates that silver nanoparticles could target cell-specific toxicity . An increasing attention towards green chemistry and utilization of plant extracts for metal nanoparticles synthesis lead to the development of environment-friendly techniques. A benefit of silver nanoparticles synthesis by using plant extracts is that it’s economical, energy efficient and cost-effective, provides healthier workplaces, and protects human health and environment. Green synthesized silver nanoparticles play a significant role in the area of nanotechnology. Synthesis of nanoparticles using plants has several advantages over other biological organisms which overcome the time-consuming process of growing microbial cultures and maintenance. Therefore utilization of plant extract for the synthesis of silver nanoparticles has potential impact in coming decades. This review discusses the various approaches to nanoparticles synthesis, a protocol for silver nanoparticles synthesis, various medicinal plant extracts utilized for the silver nanoparticles synthesis, characterization methods and its biological applications. Ahamed M, Khan M, Siddiqui M, et al. Green synthesis, characterization and evaluation of biocompatibility of silver nanoparticles. Phys E Low Dimens Syst Nanostruct. 2011; 43:1266-71. Bankar A, Joshi B, Kumar AR, et al. Banana peel extract mediated novel route for the synthesis of silver nanoparticles. Colloids Surf A. 2010; 368:58–63. Dubey M, Bhadauria S, Kushwah B. Green synthesis of nanosilver particles from extract of Eucalyptus hybrida (safeda) leaf. Dig J Nanomater Biostruct. 2009; 4:537-43. Elechiguerra JL, Burt JL, Morones JR, et al. Interaction of silver nanoparticles with HIV-1. J. Nanobiotechnol. 2005; 29:3-6. Elavazhagan T, Arunachalam KD. Memecylon edule leaf extract mediated green synthesis of silver and gold nanoparticles. Int J Nanomed. 2011; 6:1265-78. Gajbhiye, M, Kesharwani, J, Ingle A, et al. Fungus-mediated synthesis of silver nanoparticles and their activity against pathogenic fungi in combination with fluconazole. Nanomedicine. 2009; 5:382-86. Gurunathan S, Han JW, Kwon DN, et al. Enhanced antibacterial and anti-biofilm activities of silver nanoparticles against Gram-negative and Gram-positive bacteria. Nanoscale Res Lett. 2014; 9(1):373. Gurunathan S, Jeong JK, Han JW, et al. Multidimensional effects of biologically synthesized silver nanoparticles in Helicobacter pylori, Helicobacter felis, and human lung (L132) and lung carcinoma A549 cells. Nanoscale Res. Lett. 2015; 10:10-17. Gopinath P, Gogoi SK, Chattopadhyay A, et al. Implications of silver nanoparticle induced cell apoptosis for in vitro gene therapy. Nanotechnology. 2008; 19(7):075104. Gnanajobitha G, Paulkumar K, Vanaja M, et al. Fruit-mediated synthesis of silver nanoparticles using Vitis vinifera and evaluation of their antimicrobial efficacy. 2013; 3(67):1-6. Gondwal M, Pant GJN. Biological evaluation and green synthesis of silver nanoparticles using aqueous extract of Calotropis procera. Int J Pharm Biol Sci. 2013; 4(4):635–43. Jo DH, Kim JH, Lee TG, et al. Size, surface charge, and shape determine therapeutic effects of nanoparticles on brain and retinal diseases. Nanomedicine. 2015; 11(7):1603-11. Jun BH, Noh MS, Kim J, et al. Multifunctional silver-embedded magnetic nanoparticles as SERS nanoprobes and their applications. Small. 2010; 6:119-125. Jain D, Daima HK, Kachhwaha S, et al. Synthesis of plant-mediated silver nanoparticles using papaya fruit extract and evaluation of their antimicrobial activities. Dig J Nanomater Biostruct. 2009; 4:557-63. Kim JS, Kuk E, Yu, et al. Antimicrobial effects of silver nanoparticles. Nanomedicine. 2007; 3:95-101. Khurana C, Vala AK, Andhariya N. Antibacterial activity of silver: The role of hydrodynamic particle size at nanoscale. J Biomed Mater Res. A. 2014; 102:3361-68. Kim KJ, Sung WS, Moon SK, et al. Antifungal effect of silver nanoparticles on dermatophytes. J Microbiol Biotechnol. 2008; 18:1482-84. Kim S, Barry BA. Reaction-induced FT-IR spectroscopic studies of biological energy conversion in oxygenic photosynthesis and transport. J Phys Chem. B. 2001; 105:4072-83. Krishnaraj C, Jagan E, Rajasekar S. Synthesis of silver nanoparticles using Acalypha indica leaf extracts and its antibacterial activity against water borne pathogens. Colloids Surf B Biointerfaces. 2010; 76:50-6. Krishnaraj C, Ramachandran R, Mohan K, et al. Optimization for rapid synthesis of silver nanoparticles and its effect on phytopathogenic fungi. Spectrochim. Acta A. 2012;l 93:95-99. Kumar S, Daimary RM, Swargiary M, et al. Biosynthesis of silver nanoparticles using Premna herbacea leaf extract and evaluation of its antimicrobial activity against bacteria causing dysentery. Int J Pharm Biol Sci. 2013; 4(4):378–84. Kumar AS, Ravi S, Kathiravan V. Green synthesis of silver nanoparticles and their structural and optical properties. Int J Curr Res. 2013; 5(10):3238–40. Kaviya S, Santhanalakshmi J, Viswanathan B, et al. Biosynthesis of silver nanoparticles using Citrus sinensis peel extract and its antibacterial activity. Spectrochem Acta A Mol Biomol Spectrosce. 2011; 79:594-8. Kesharwani J, Yoon KY, Hwang J, et al. Phytofabrication of silver nanoparticles by leaf extract of Datura metel: Hypothetical mechanism involved in synthesis. J Bionanosci. 2009; 3:39-44. Lara HH, Ayala-Nunez NV, Ixtepan-Turrent L, et al. Mode of antiviral action of silver nanoparticles against HIV-1. J. Nanobiotechnol. 2010; 8:1. Lok CN, Ho CM, Chen R, et al. Proteomic analysis of the mode of antibacterial action of silver nanoparticles. J. Proteome Res. 2006;5: 916-24. Lin PC, Lin S, Wang PC, et al. Techniques for physicochemical characterization of nanomaterials. Biotechnol Adv. 2014 32(4):711-26. Masurkar SA, Chaudhari PR, Shidore VB, et al. Rapid biosynthesis of silver nanoparticles using Cymbopogan Citratus (Lemongrass) and its antimicrobial activity. Nano-Micro Lett. 2011; 3(3):189-94. Monteiro DR, Silva S, Negri M, et al. Silver nanoparticles: Influence of stabilizing agent and diameter on antifungal activity against Candida albicans and Candida glabrata biofilms. Lett. Appl. Microbiol. 2012; 54:383-91. Nanda A, Saravanan M. Biosynthesis of silver nanoparticles from Staphylococcus aureus and its antimicrobial activity against MRSA and MRSE. Nanomedicine. 2009; 5:452-56. Nakkala JR, Mata R, Gupta AK, et al. Green synthesis and characterization of silver nanoparticles using Boerhaavia diffusa plant extract and their antibacterial activity. Indus Crop Prod. 2014; 52:562–6. Nakkala JR, Mata R, Kumar Gupta A, et al. Biological activities of green silver nanoparticles synthesized with Acorous calamus rhizome extract. Eur J Med Chem. 2014; 85:784-94. Narayanan KB, Park HH. Antifungal activity of silver nanoparticles synthesized using turnip leaf extract (Brassica rapa L.) against wood rotting pathogens. Eur J Plant Pathol. 2014; 140:185-92. Ogar A, Tylko G, Turnau, K. Antifungal properties of silver nanoparticles against indoor mould growth. Sci. Total Environ. 2015; 521:305-14. Prasad TNVKV, Elumalai E. Biofabrication of Ag nanoparticles using Moringa oleifera leaf extract and their antimicrobial activity. Asian Pac J Trop Biomed. 2011; 1:439-42. Rout A, Jena PK, Parida UK, et al. Green synthesis of silver nanoparticles using leaves extract of Centella asiatica L. For studies against human pathogens. Int J Pharm Biol Sci. 2013; 4(4):661-74. Roy A, Bharadvaja N. Silver nanoparticles synthesis from a pharmaceutically important medicinal plant Plumbago zeylanica. MOJ Bioequiv Availab. 2017; 3(5): 00046. Rajakumar G, Rahuman AA. Larvicidal activity of synthesized silver nanoparticles using Eclipta prostrata leaf extract against filariasis and malaria vectors. Acta Trop. 2011; 118:196-203. Rupiasih NN, Aher A, Gosavi S. Green synthesis of silver nanoparticles using latex extract of Thevetia peruviana: A novel approach towards poisonous plant utilization. J Phys Conf Ser. 2013; 423:1-8. Santhoshkumar T, Rahuman AA, Rajakumar G, et al. Synthesis of silver nanoparticles using Nelumbo nucifera leaf extract and its larvicidal activity against malaria and filariasis vectors. Parasitol Res. 2011; 108:693-02. Salunke GR, Ghosh S, Santosh Kumar R. Rapid efficient synthesis and characterization of silver, gold, and bimetallic nanoparticles from the medicinal plant Plumbago zeylanica and their application in biofilm control. International Journal of Nanomedicine, 2014; 9:2635-53. Sadeghi B, Gholamhoseinpoor F. A study on the stability and green synthesis of silver nanoparticles using Ziziphora tenuior (Zt) extract at room temperature. Spectrochim Acta Part A: Mol Biomol Spectrosc. 2015; 134:310-5. Sunita D, Tambhale D, Parag V, et al. Facile green synthesis of silver nanoparticles using Psoralea corylifolia. Seed extract and their in-vitro antimicrobial activities. Int J Pharm Biol Sci. 2014; 5(1):457-67. Sondi I. Salopek-Sondi B. Silver nanoparticles as antimicrobial agent: A case study on E. coli as a model for Gram-negative bacteria. J. Colloid Interface Sci. 2004; 275:177-82. Sadeghi B, Gholamhoseinpoor F. A study on the stability and green synthesis of silver nanoparticles using Ziziphora tenuior (Zt) extract at room temperature. Spectrochim Acta Part A: Mol Biomol Spectrosc 2015; 134:310-5. Sastry M, Patil V, Sainkar SR. Electrostatically controlled diffusion of carboxylic acid derivatized silver colloidal particles in thermally evaporated fatty amine films. J Phys Chem B. 1998; 102:1404-10. Stephan TS, Scott EM, Anil KP, et al. Preclinical characterization of engineered nanoparticles intended for cancer therapeutics. In: Amiji M.M., ed. Nanotechnology for Cancer Therapy. CRC Press; Boca Raton, FL, USA 2006; 105–137. Taleb A, Petit C, Pileni M.P. Optical properties of self-assembled 2D and 3D superlattices of silver nanoparticles. J Phys Chem. B. 1998; 102:2214-20. Thombre R, Parekh F, Patil N. Green synthesis of silver nanoparticles using seed extract of Argyreia nervosa. Int J Pharm Biol Sci 2014; 5(1):114-9. Tomaszewska E, Soliwoda K, Kadziola K, et al. Detection limits of DLS and UV-VIS spectroscopy in characterization of polydisperse nanoparticles colloids. J Nanomater. 2013; 2013:313081. Ulug B, HalukTurkdemir M, Cicek A, et al. Role of irradiation in the green synthesis of silver nanoparticles mediated by fig (Ficus carica) leaf extract. Spectrochim Part A: Mol Biomol Spectrosc 2015; 135:153-61. UV/VIS/IR Spectroscopy Analysis of Nanoparticles, 2012. Williams DB, Carter CB. The transmission electron microscope. Springer Verlag; New York, NY, USA: 2009. Xiang DX, Chen Q, Pang L, et al. Inhibitory effects of silver nanoparticles on H1N1 influenza A virus in vitro. J. Virol. Methods 2011; 178:137-42. Yao H, Kimura K. Field emission scanning electron microscopy for structural characterization of 3D gold nanoparticle super lattices. In: Méndez-Vilas A., Díaz J., eds. Modern Research and Educational Topics in Microscopy. Formatex Research Center; Badajoz, Spain: 2007: 568–575. Zhang XF, Liu ZG, Shen W, et al. Silver nanoparticles: synthesis, characterization, properties, applications, and therapeutic approaches. Yan B, ed. International Journal of Molecular Sciences. 2016; 17(9):1534. Zodrow K, Brunet L, Mahendra S, et al. Polysulfone ultrafiltration membranes impregnated with silver nanoparticles show improved biofouling resistance and virus removal. Water Res. 2009; 43:715-23. Zargar M, Hamid AA, Bakar FA, et al. Green synthesis and antibacterial effect of silver nanoparticles using Vitex negundo L. Molecules 2011;16:6667-76.